Google Home has some impressive microphones built into it and can hear you for a good distance away depending on the ambient noise level of your home. Sometimes, however, it would be nice to get some sort of acknowledgement that Home actually heard your command. Sure you have the swirling lights at the top but what if you aren’t looking at it or are even out of sight of your Home? Fortunately there is an easy way around this and it all comes down to a setting inside the Home app. In this How To I’ll show you how to set up your Google Home to give you an audible tone when you start or end a request. overflow menu (the three vertical dots) and select settings. Towards the end of the page you will see options for Accessibility. Tap that and now you will see a page that enables sounds. 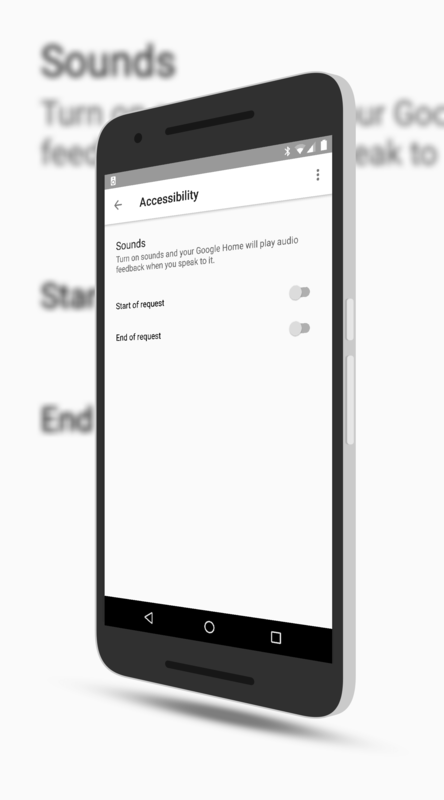 Using the slider switch, you can enable an audible tone to be played at the start of a request (when you say “Hey Google”) or at the end of a request. Obviously you can enable both if you choose. Once you have these turned on, give it a try by giving your Google Home a command. You should hear a short tone at the start or end of the command (or both) depending on how you have configured it. For more How To’s, be sure to check out the How To’s & Helpful Guides here on the site.